Do not miss another Austrian Airlines voucher! 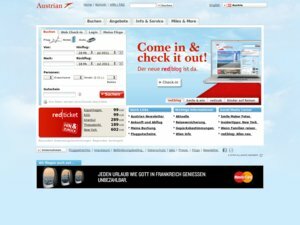 Simply leave your e-mail address and we'll always keep you informed of new vouchers for Austrian Airlines. Offer condition: Travel period from 06.04. - 30.11.2010. Offer condition: There is no limit to how many bookings you make! The offer applies for return flights ex London only; bookings can be made from 22.12.08 until 31.01.2009. All travel must commence on OS flight numbers between 01.01.2009 and completed no later than 30.11.2009. Latest voucher code valid at a time of promo publication was entered to be working from 2015-10-31.